"Other omissions in the JIO file released to Keith (Basterfield) may have been due to typical file attribution effects and file “borrowings”, sensitivities about the material or other matters, rather than any inherent substantial content. 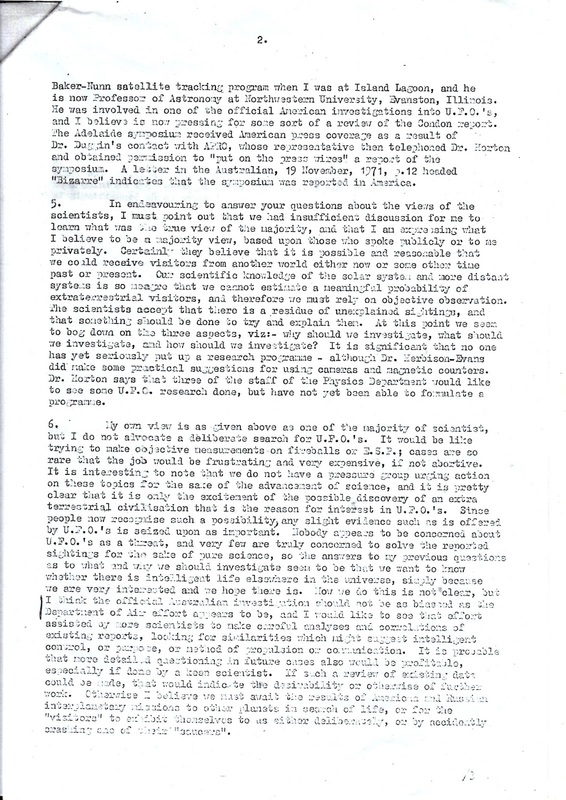 For example there is a Department of Supply internal memorandum from the Radar and Electronic Group: “Regarding Recent Symposium on UFOs” which discusses the 1971 ANZAAS UFO symposium. 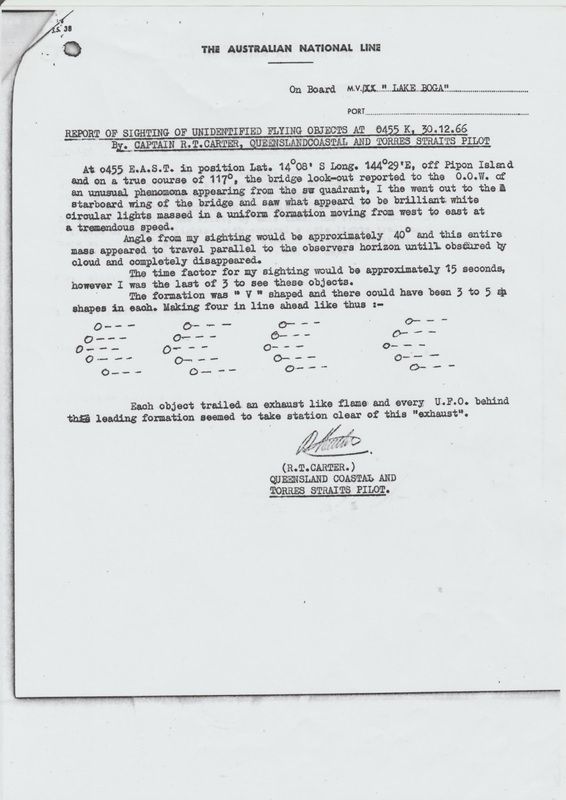 Another describes a sighting by crew of an ANL ship off Pipon Island in 1966. Other similarly miscellaneous content may lurk in other agency files and their presence in the papers of a JIO scientist may be just due to a variant on the “lightning rod” principle." 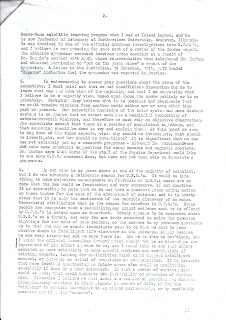 This 3 page internal Department of Supply memo dated 2 December 1971, was written by (Norm) C.N. 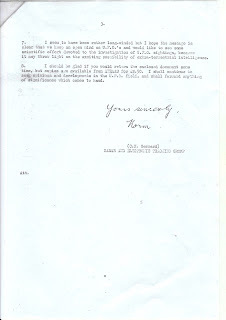 Gerrard of the Radar & Electronic Tracking Group, WRE (Weapons Research Establishment), and sent through the Controller Research & Development to (Tom) T.F.C. 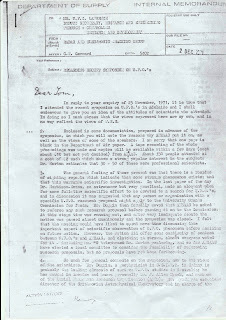 Lawrence, then Deputy Secretary, Research & Engineering, Department of Supply, in response to Lawrence's enquiry of 25 November 1971. 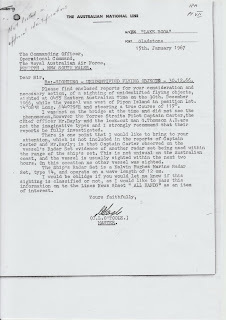 Norm Gerrard was a veteran of the Department of Supply and in Peter Morton's "Fire across the desert - Woomera & the Anglo-Australian Joint Project 1946-1980" (1989) was described as "a quiet conscientious man who had worked on radio and radar in (V.) Bosher's instrumentation section of Bomb Ballistics Group. He duly spent some months with (F.H.) 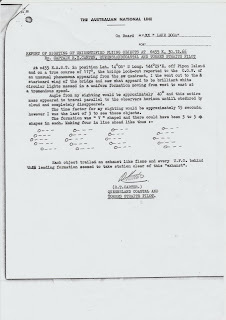 East (the RAE expert) at RAE (in Britain) and then returned to take over the scientific direction of the VT (variable time) fuze trials (1952-53)." 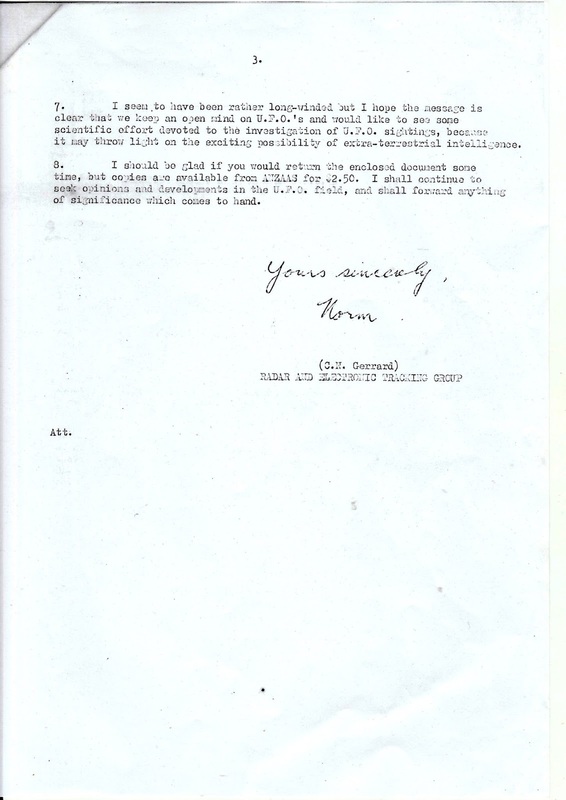 Gerrard emphasised in his memo to Lawrence that the views expressed were his own and not WRE's. 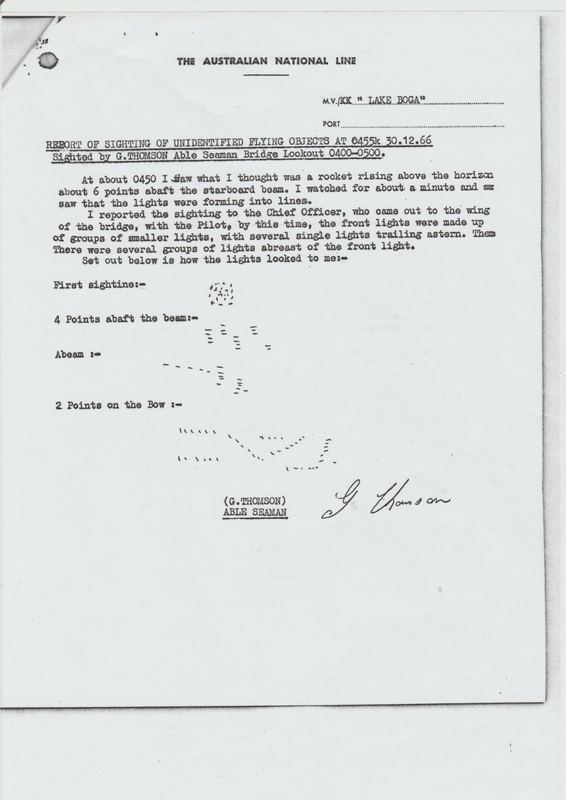 He describes the ANZAAS UFO symposium held in 1971, the work of some of the scientists, particularly highlighting that of Dr. Michael Duggin, who he described as "probably the leading advocate of serious UFO studies in Australia." I described Mike Duggin's impressive contributions in my article "The Australian scientist who was a potent part of the UFO "Invisible College" - Dr. Michael Duggin (1937-2016) - a tribute" which appeared in slightly different forms in both the Australian magazine "Ufologist" and the UK e-magazine "UFO Truth". Norm Gerrard gives a good insight to the views of the scientists present on the subject of UFOs and science and also highlighted the limitations of the symposium. His own views, while not advocating "a deliberate search for U.F.O. 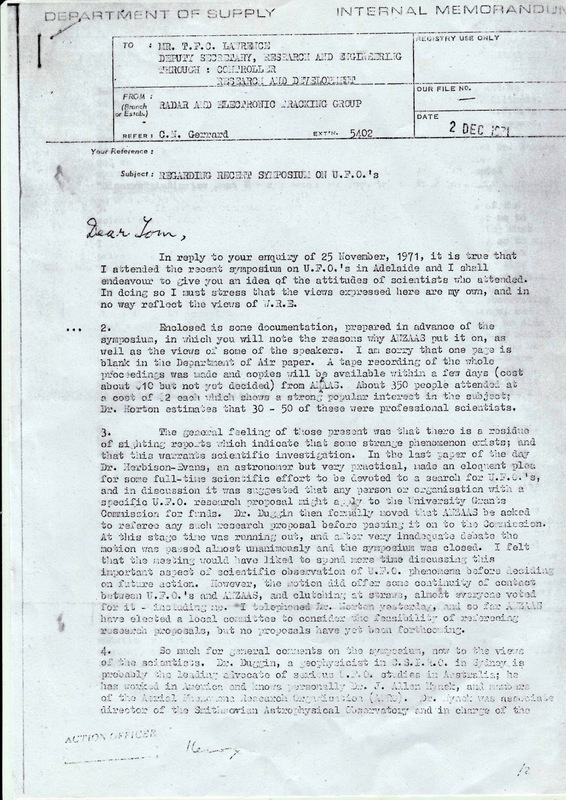 's", did highlight that he thought "the official Australian investigation should not be as biased as the Department of Air (RAAF) effort appears to be, and I would like to see that effort assisted by more scientists to make careful analyses and correlations of existing reports, looking for similarities which might suggest intelligent control, or purpose, or method of propulsion or communication." He was apparently unaware of Harry Turner's secret attempt to do precisely this (described to some extent in the JIO & DSTO files) and the fact that Harry himself attended in an undisclosed capacity, while his secret research associate Mike Duggin took the public profile. Gerrard stressed to Lawrence "that we (should) keep an open mind on U.F.O. 's and would like to see some scientific effort devoted to the investigation of U.F.O. 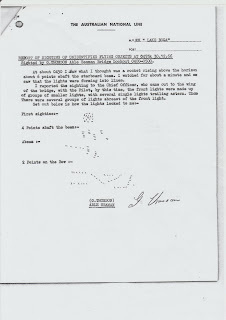 sightings, because it may throw light on the exciting possibility of extra-terrestrial intelligence." 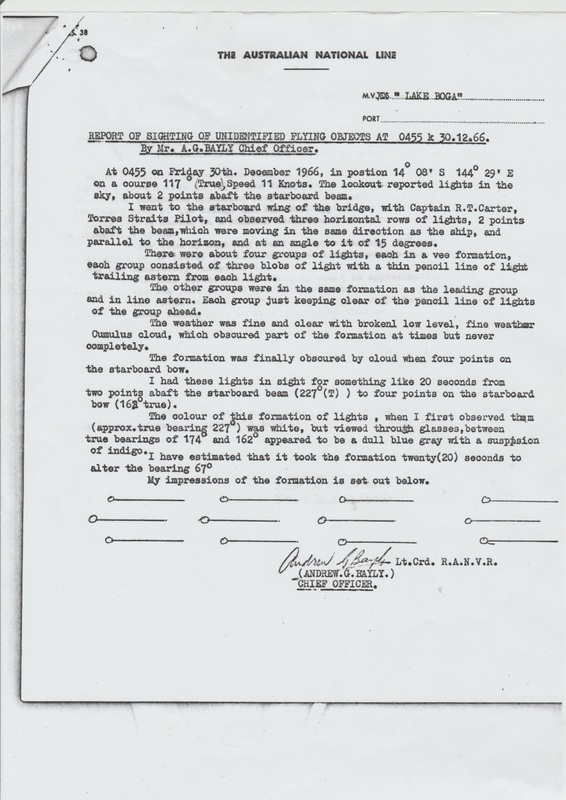 "UFO Sighting by crew of ANL ship off Pipon Island in 1966"
This interesting report from crew of the Australian National Line vessel "Lake Boga" of the Queensland coast near Pipon Island on 30 December 1966 may have an astronomical explanation, but the look-out" man Able Seaman G. Thomson had a more extended viewing of the spectacle for seemingly significantly more than a minute from about 0450 EST describing it as like "a rocket rising above the horizon, then after about a minute forming "into lines" with varying movements. The ship's radar apparently doesn't detect the formation of lights but picks up that another vessel may have been operating radar in the area. 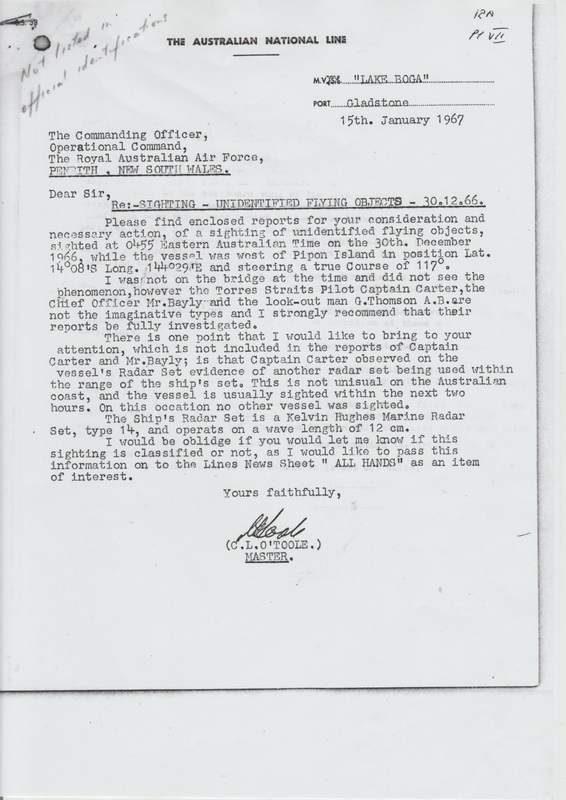 Interesting Harry Turner annotates the report: "Not listed in official identifications." 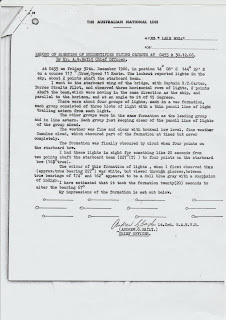 We are fortunate that Harry Turner preserved these interesting documents.